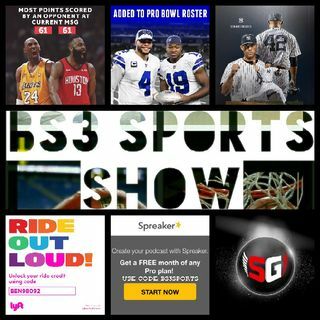 BS3 Sports Show - "Should the NFL Cancel the Pro Bowl?" Pro Bowl time...snore! Also, talking sports topics from this week! Contact me if your interested. Order shirt in custom color combinations. Let's go to more live events! Sign up for SeatGeek and get $20 off your first purchase. Yes, but thanks for coming thru! Thanks for the show, Ben! You get a chance check out Business Wars podcast. They have a series on Adidas vs Nike. Talks about shoes and apparel competition. The NFL has fined Los Angeles Rams cornerback Nickell Robey-Coleman for his controversial hit in the fourth quarter of the NFC Championship Game. Per ESPN's Adam Schefter, Robey-Coleman was docked $26,739 for his helmet-to-helmet hit on New Orleans Saints receiver Tommylee Lewis, which the officials didn't call a penalty on.